Make It All Come Together For Mac And Jenny McCord. Jenny, the oldest of six kids, landed in Greenville at age 9, when her mother moved the family there to be close to Jenny’s grandparents. She met Mac at Jacobs Engineering, where they worked together for over 25 years. Mac traveled extensively for the company, and Jenny, he says, “ran the office while I was gone.” In 1998, after years of professional and personal friendship, the relationship transitioned into something new. By this time Mac was widowed and Jenny was divorced, and the two made the decision to marry. “It’s nice to marry someone who is your friend,” says Jenny. With the lot purchased, their Hilton Head home went on the market – in one of the worst real estate downturns in recent memory. The wait, which ended up being a year, required some patience. As Mac recalls, “Once you get it in your mind you’re relocating, you’re already there.” Meanwhile, the couple began thinking about what kind of home they would like to build, and what kind of builder they wanted to build it. Location already decided, they focused on the next key decisions: it was going to be the right plan; it was going to be the right builder. “I became quite frustrated trying to find a home plan we loved,” recalls Mac. 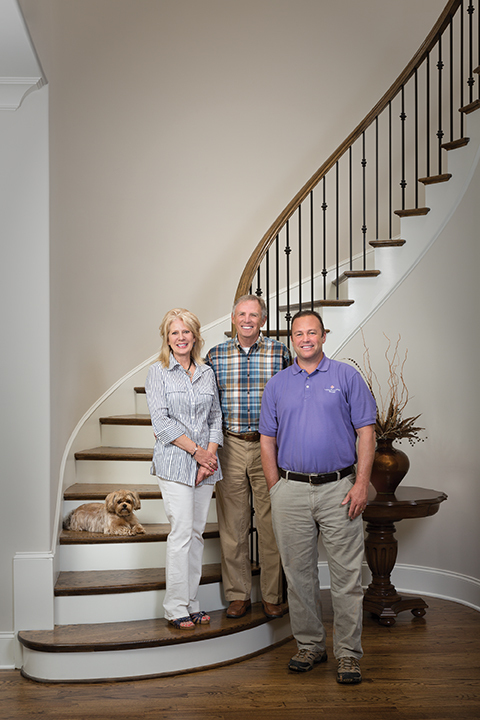 “I spent two solid years looking at house plans on the Internet.” Eventually, the search for home and builder intersected with Greenville’s Arthur Rutenberg Homes franchisee, American Eagle Builders. A meeting with building company president Bruce Pasquarella easily sealed the deal. “I had heard of American Eagle Builders,” says Jenny. “I knew their reputation. We didn’t talk to any other builders after we talked with Bruce.” Soon, things began moving quickly. Jenny and Mac received an all-cash offer on their home, with a big contingency: they needed to be out in three weeks. So they packed up the Hilton Head house, rented a home in Greenville, and got busy planning the construction of their new home. Project Manager Nicole Frasier introduced the McCords to designer Angeline Rudnick at the Arthur Rutenberg Homes Charlotte Design Studio for assistance in selecting finishes for their home. The McCords brought plenty of ideas to the table, including Jenny’s Pinterest inspiration board, and a favorite rug they used as the starting point for the home’s color palette. 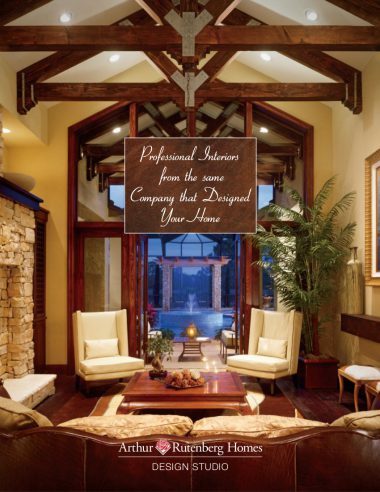 The Charlotte Design Studio serves clients across North and South Carolina, Georgia, and Tennessee, working with some eighty homeowners every year and eight active builders. To help ensure the two-day session will be extra productive, Angeline says she “likes to assign a little homework.” She asks clients to set up a Pinterest board or a Houzz account, and email her in advance, so she and the studio design team can prepare for the upcoming session. “We take our time to learn how our clients will live in the home,” says Angeline. “We ask a lot of questions. Do they have pets? Children?” “A home is really the client’s habitat. We want to deliver fantastic style and color harmony that reflects the client. And we want to make sure the home will function for them.” Angeline has a proven process that makes the daunting selection task go smoothly. On day one, she begins with exterior selections like roof, brick, stone. Inside, she begins with the kitchen, “the heart of the home,” and then decisions cascade from there. “I always tell my clients I have all the pieces of the puzzle right here, and that when we are finished, they will all lock together seamlessly.” On the morning of day two, when the clients are refreshed, the selection process begins with another important room: the master bedroom. As they are working, selections are laid out on a large central table so it is easy to see how everything works together. Angeline creates a Pinterest board, with every selection tagged. “For every home, we also create a template. It includes every detail the builder will need. No nuance is missed. By the end of our session, we’ll generate twenty pages with ten selections per page. It’s very thorough.” One of the most important services the studio offers is providing a professional who will help clients stay within their allowances. “When a client expresses interest in a detail over their allowance, I can immediately confer with their building concierge and let them know on the spot what the price difference will be,” says Angeline. At that point, a client can say yes, or no, or even maybe. Angeline can suggest an alternative within the allowance, providing the client a Plan A and a Plan B to choose from once all the figures are tallied. Jenny and Mac came prepared to keep tight reins on their budget, a lesson not lost on them from their previous homebuilding experience. 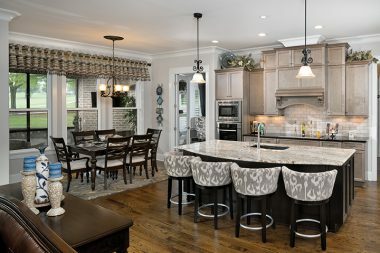 Mac recalls working with the personal shopper assisting them with their Hilton Head home to choose hardware, cabinets, countertops, flooring, and all the other finishes and selections necessary for a home. “Two weeks later we got the cost – $150,000 over budget. We said goodbye and went and got ourselves another builder.” So this time around, “at the Design Center we told them, if we go outside the budget, let us know, and we’ll make that call.” There were a few upgrades, like the special granite for the magnificent kitchen island countertop, that were planned splurges. They also invested in whole-house spray foam insulation and a tankless water heater. 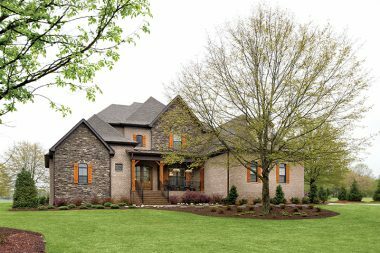 But the Asheville is loaded with enough luxury touches that come standard that the McCords did not need to add much, nor increase their budget substantially, to end up with the beautiful home they desired.